In a study published today in The American Naturalist, a group of scientists led by the Zoological Society of London (ZSL) have used a technique developed to study human consumer choices to investigate what influences a baboon's foraging decisions. The technique, known as discrete choice modelling, has rarely been used before in animal behaviour research. It showed how baboons not only consider many social and non-social factors when making foraging decisions, but also how they change these factors depending on their habitat and their own social traits. Over a six month period in Tsaobis Leopard Park in Namibia, ZSL scientists followed troops of chacma baboons (Papio ursinus) on foot from dawn to dusk. They recognised individual baboons by distinguishing features, and closely observed both the aggressive and friendly social relationships between baboons, noting which food patch they foraged in and who they foraged with. As expected, baboons were more likely to use patches containing more food. More interestingly, they also paid attention to their social relationships with other baboons in the patches. Harry Marshall, from ZSL and Imperial College London conducted the research. He says: "More dominant baboons preferred using patches containing animals who they were dominant to, and so more likely to be able to steal food from. However, these less dominant baboons seemed to compensate for this by preferring patches containing animals with whom they had good social bonds and so were more likely to tolerate them." ZSL's Dr Guy Cowlishaw added: "These findings show how animals' decision-making can be dependent on where they are and who they are. This suggests that some animals can change their behaviour to adjust to a changing environment." Scientists at ZSL will continue working with collaborators and use the findings from this study to help them investigate how baboons' foraging behaviour is affected by changes in the environment, and the impact this will have on socially foraging species in the future. It should be understood that the use of the word "choice" in the title does not imply a conscious analytic thought process is occurring in monkeys. The behavior is almost certainly an emergent property of a larger set of genetically determined traits. for example simply the ability to smell and associate that smell with being the victim of aggression or partner in a friendly relationship could lead to this behavior. 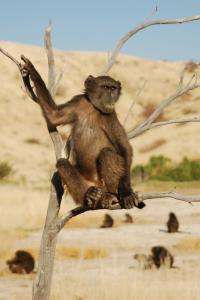 In a similar way, the baboons "paying attention" to social relationships should not to be taken as an indication they have the ability consciously direct their attention based on abstract concepts. These things may be possible for lower primates, but a conscious abstracted thought process is not a requirement for explaining the observations.